Research Interest: Water treatment, Synthesis and characterization of: Polymers, Bio-polymers, IPN´s, Hydrogels, Composites, Lignocelluloses materials, Modeling and simulation, Nanotechnology, Controlled drug delivery systems. In particular, skin, diabetes mellitus, antifungical, Design and preparation of oral solid (tablets and capsules) dosage forms, Analysis of drugs in pure forms, formulations and biological matrices and Bioadhesive drug delivery systems, especially hydrogels. Biography: Dr. Rangel-Vázquez is a research at PCC. She has over 36 publications in peer reviewed journals, two books, 12 chapters and50 memories congress to her credit. She served as a reviewer for several journals: Journal of Applied Polymer Science, Materials Letters, Carbohydrate Polymers, Journal Polymer Engineering & Science, Thermochimica Acta, Journal of Molecular Structure, Journal of Surface and Coatings Technology, Academic Journal of Agricultural Research, World Journal of Engineering and Physical Sciences (WJEPS), Annual Research & Review in Biology, Journal of Applied Physical Science International, Global Conference on Polymer and Composite Materials 2015 and International Journal of Nanomedicine. 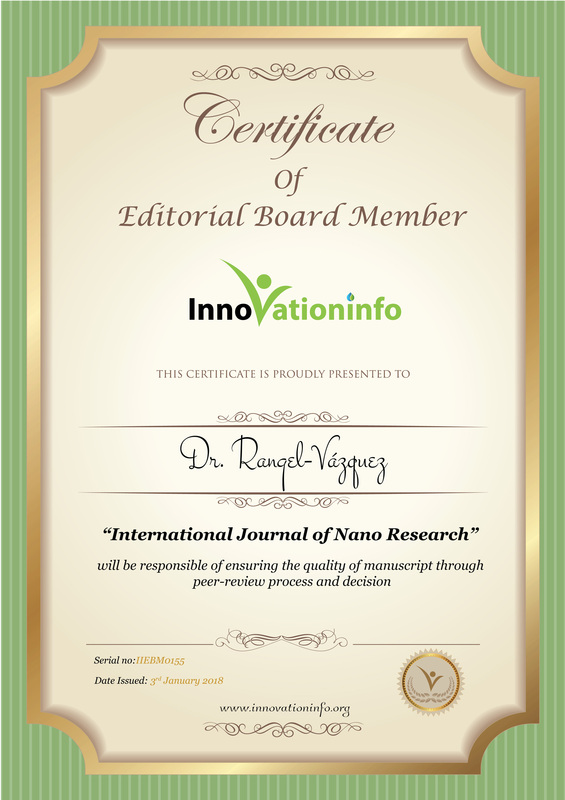 One of the Editorial Board of several journals including Journal of Pharmaceutics & Drug Development, Material Science and Engineering with Advanced Research, Journal of Nanomedicine Research, Nanomedicine Research Journal, Chemistry Journal, BAOJ Pharmaceutical Sciences (Bioaccent), Independent Journal of Management & Production (Brazil) and Global Journal of Nanomedicine. Editor in Chief of BAOJ Pharmaceutical Sciences and the Journal of Pharmaceutics & Drug Development, respectively.